Earth Day falls on April 22, but you can celebrate all month long. Make small green changes in your household that can have a big impact in your life. Start by looking for eco-friendly, chemical-free products for your home and your family. Making your own household cleaners is a great way to clean green. However, you can also buy a number of chemical-free cleaning products that are safe to use around babies, children and adults. Try Dapple products -- their Dapple Clean Up Kit ($20) makes putting your green foot forward a snap. 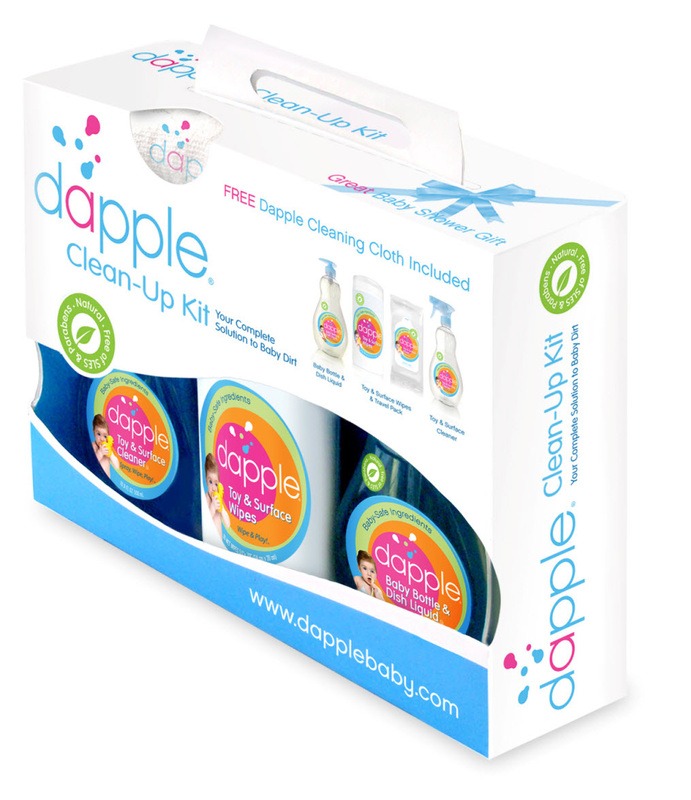 The kit features four fabulous Dapple products -- Dapple Baby Bottle & Dish Liquid, Toy & Surface Cleaner Spray, Toy & Surface Cleaner Wipes and Travel Pack, plus a free cleaning cloth. Reduce plastic bag waste by using reusable snack and sandwich bags instead. ReSnackIt offers a full line of these bags in fun colors and designs. ReSnackIt bags ($8-$11) come in various sizes for all your needs. Zoli offers a unique line of feeding and care products for babies and toddlers. All their products are made with non-toxic materials to protect your little ones. Their newest product -- the SUMO Snack Stacker ($18)-- lets you pack fresh snacks, separated and sealed, when you’re out and about! Detach any of the four levels to take only as many cups as you need. Take baby steps toward green living. Replace your standard light bulbs with CFLs. Each CFL should save about $30 in energy costs over the life of the bulb. Set up a convenient recycling system. Even little kids can recycle if you make the process easy for them. Put pictures on each receptacle for children who can't yet read. Install a new thermostat. Many power companies will install an easy-to-use programmable thermostat in your home for free. Plant a vegetable garden with your kids. Homegrown fruits and vegetables are cheap and nutritious. You can even grow a garden on your window sill. Never drive when you can walk or bike. Stay fit and reduce consumption of fossil fuels by finding ways to drive less and less.